This is a uniquely hand-crafted-with-human-care Victorian ladys desk set. Several types of realistic, high-end papers were used to create this collection. 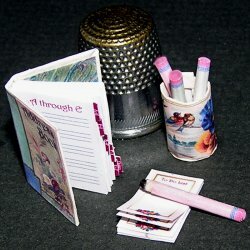 Included in the set is a true New Orleans turn-of-the-century sketch journal and an address book with real alpha-tabs so technologically high-end that both are readable! Six reproduction Victorian era two-sided post cards, cabbage rose motif desk caddy replete with matching stationery set tied with 100% silk ribbon (4 envelopes and 4 sheets), stand-up 12-page 1880 desk calendar, desk blotter with realistic corners and simulated blotter paper, pencil can with 3 pretty color-coordinated faux pencils, 8-page to-do tablet, and stand-up baby photos from personal family collection. Desk not included.